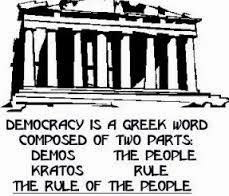 Democracy has many definitions and people can reveal their philosophical and ideological leaning based on how they define the word. The most common or even generic definition of democracy perhaps is “power by the people, for the people.” This connotes or implies that the people have similar if not monolithic interests and goals in society, which very often is not the case. Another common definition is that democracy is “rule and will of the majority/people” in society and such majority rule should prevail over the minority. Critics of this definition call this as “mob rule” where the mob act in behalf of the majority, whether real or imaginary majority. And still another definition is that democracy means “equal participation” by the people either through direct involvement or elected/representative democracy. A lesser-known definition is that democracy means “respect and tolerance of minority opinions” so that such minority opinion can be heard and discussed without feat of persecution and harassment by the State or other armed groups. 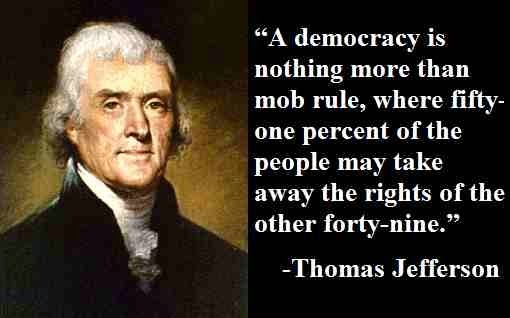 One indicator if people hate democracy is that they want all things to be legislated and forcibly enforced nationwide. Or if a local legislation, those things should be forcibly enforced province-wide or city-wide. Choice is zero as things have been legislated already, with fines, penalties and even imprisonment for violation. Most legislations and coercion are done to favor one sector and deny the same favor to other sectors as if they are not citizens or taxpayers of the same country. For example, if a new state college or university is created in one province, only students and faculty, officials of that new university will get taxpayers' subsidy while students, faculty, officials of private universities in the same province or big city do not get the same subsidy, as if they and their parents are non-taxpayers of the country. Or when a legislation or Executive Order was made to subsidize MRT/LRT passengers in Metro Manila, passengers in Ilocos, Cagayan Valley, Bicol, Visayas, Mindanao are not given the same fare subsidy as if they are not taxpayers of the country. That is why legislation that favor one sector but exclude other sectors should be avoided whenever possible. Such practices are actually undemocratic as a big portion of the country's population are excluded from certain favoritism by the state. Most majority decisions are done outside of government and legislation. For instance, if people want cheaper clothes, cheaper shoes, toys, food, etc., they do not go to the streets to rally and demand that government through DTI or LGUs or Congress should impose price control on clothes, shoes, toys, food, etc. of SM, Robinsons, Rustans, Ayala malls, etc. Instead, many people go to Divisoria, Baclaran, tiangge-tiangge, etc. where cheap goods and services are available with zero politics and government horse-trading involved. My good Indian friend, Barun Mitra, is correct in saying that for government "democracy has to be minimal, so that it does not offend or alienate too many people." This implies that the more vibrant the democracy is, the smaller the government should be, where smaller social actors (the smallest actor is the individual, not a clan or trade union, etc.) are supposed to be empowered at the expense of the government. Civil society or self-government can be considered as democratic governance. When a Rotary club or Lions club or Jaycees etc. conduct medical and dental mission and give away free healthcare, free medicines even for one day, it already has high impact on the people of a community that received such civil society action. More self-government means less institutional, taxpayers-funded government. They are all part of real democracy. "Democracy is not about majority rule, but about recognition of and respect for minority opinions. So that the minority view of today, may enjoy the freedom to peacefully persuade others, and could become a majority opinion of tomorrow." I suggested that unhampered democracy can lead to socialism and totalitarianism. If the majority will decide that they should eat, have free or subsidized housing, etc. even if they donot work or work very little, then a law will be passed to reflect the will of the majority. Socialism and forced equality is the ultimate result, and since the middle class and upper class will resist, then totalitarianism and strong arm dictatorship will evolve. The limit to democracy is rule of law. The law applies equally to unequal people. If people want to eat even if they do not work, then all other people should be allowed to not work also, the socialist government can collapse. It can stay afloat by endless borrowing, and/or selling its land and other resources so it will have money to feed people who do not want to work. That is one proof why socialism will never be successful, but many intellectuals and masa want socialism. They want to be the new dictators. An unfettered or limitless democracy will ultimately result in socialism and totalitarianism and hence, a negation of democracy. Democracy tempered by rule of law -- the law against stealing and destruction of property, law against murder and harming other people, law against abduction and repression of individual liberty -- is ideal. Socialism and totalitarianism can never prosper in that condition. Can unfettered democracy be the button of self-destruction to all types of states, or the button for further/endless expansion of states and governments? Notice that almost all democratic governments around the world, from N. America to Europe to Asia have an expanding public sector, not only at the national or federal level but also at the local (state, province, city, village/barangay) levels. Before, a lazy or irresponsible person will have no money, now he can get cash monthly from the government on top of free education for the kids, free healthcare. Before, it is relatively easy to put up a shop; now one needs to get dozens of permits and pay lots of taxes and fees to officially start a business. To conclude, unlimited or unchecked democracy can lead to populism, welfarism and socialism. From books and education for the poor, medicines and healthcare for the poor, housing and relocation for the poor, tractors and credit for the poor, electric tricycles and MRT fare subsidy for the poor, cash transfer and condoms for the poor, all of which are existing and implemented, an iPad for the poor, 2nd-hand cars for the poor will not be far behind in the near future. All in the name of democracy, unfettered, populism and welfarism will expand.